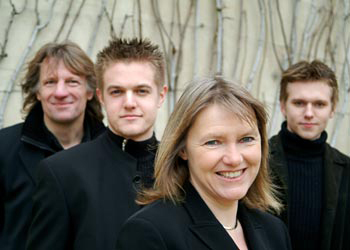 If you are looking for lively, melodic Celtic tunes and a good singalong, Blackthorn are for you. All the band are multi-instrumentalists, and can provide a varied and traditional feel to the music. 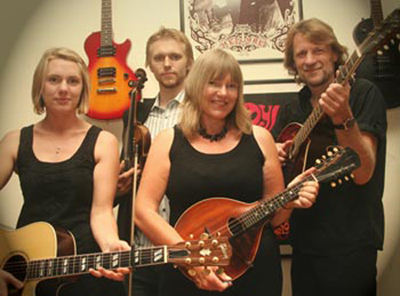 Blackthorn’s music is led by strong flute, whistle and fiddle melodies, backed by guitar and bouzouki rhythms and contrasted with the sounds of concertina and their many other instruments. 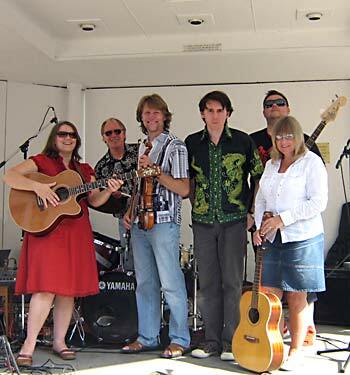 They have performed at many folk and arts festivals including Sidmouth Folkweek where according to Seered.co.uk “Blackthorn were one of the best bands on offer during the whole week. ..Have them back next year! Blackthorn perform their melodic brand of Irish, Scottish and English traditional music at festivals, folk clubs, weddings and functions and private parties. Founder members Fergus and Mannie McClelland have been performing traditional music for many years, and also play in ceildh band ThingumaJig. Philippe Barnes – a finalist in the BBC Radio 2 Young Folk Awards joined in 2001, Alex Percy – also a member of young upcoming folk band Beltaine, stars of several major festivals, joined in 2003 and the line up is completed by the return from the USA of Sarah Mooney. “Far From Home” – Blackthorn’s debut album, and a collaboration with whistle maker Phil Hardy – was released in March 2004, their second “The River That Runs Below” came out in 2008. The band is also available with as a larger line-up with the addition of Philippe Barnes on Flute, Whistle, Guitar, Bodhran.